Want to be added to our media list for news releases? Email your contact info to jim.hendricks@albanymuseum.com. The AMA hosts its Summer Reception 5-7 pm Aug 9, 2018 for Neighborhood for Painters, Educators as Artists and Florence Prisant: A Retrospective. We appreciate our educators, so the AMA is offering a free evening for teachers in our area to get together, enjoy some late summer "freedom" and get information on ways the AMA and other local organizations can help them during the quickly approaching school year. The Contemporaries is a new group of AMA supporters ages 21-45 who are planning quarterly events that will combine their love for art with getting together with friends, making new ones at entertaining events. The first is set for July 26. An exhibition of the work of Albany artist Florence Samuels Prisant opens June 14 and continues through August 25 in the West Gallery. While films have long been regarded as art, Loving Vincent, a movie being presented at dusk on June 8 at the Albany Museum of Art by the Albany Recreation & Parks Department, takes the art of movie-making to an entirely new level. The Albany Museum of Art is inviting college faculty to participate in Educators as Artists: Juried College Faculty Exhibition, which will open August 2 and run through October 13, 2018 in the AMA’s East Gallery. The all-medium exhibition will be juried by artist and curator Didi Dunphy. Gerald Corker of Cairo is the winner for the Second Congressional District in the annual Congressional Art Competition. The Albany Museum of Art is providing airfare for a parent to accompany him to Washington, D.C., as well as hotel accommodations and a $250 purchase offer for the winning artwork. Chef John Gargano will bring three generations of Italian recipes to the table for a poolside dinner on May 5 at the Albany residence of Amy Jones. A few tickets are still available. Spring Family Day, a partnership of the Albany Museum of Art and the Albany Recreation & Parks Department, returns to the AMA 10 am-noon Saturday, April 21. Sculptor Glenn Dasher returns to Albany for two days of events. On April 17, he will participate in the AMA's "What Is Art?" discussion. On April 18, he will conduct a welding demo at Albany Technical College, followed by a gallery talk that evening at the AMA. On April 17, a panel of five art experts will discuss ther age-old question, "What Is Art?" The group also will take qiestions from those attending the event at the AMA. Interdisciplinary artist Justin Hodges talks about his work ahead of the opening of his installation at the AMA, Time Time and a Half. This is the final week to see the Georgia Council for the Arts' exhibition of photographs, Inspired Georgia. 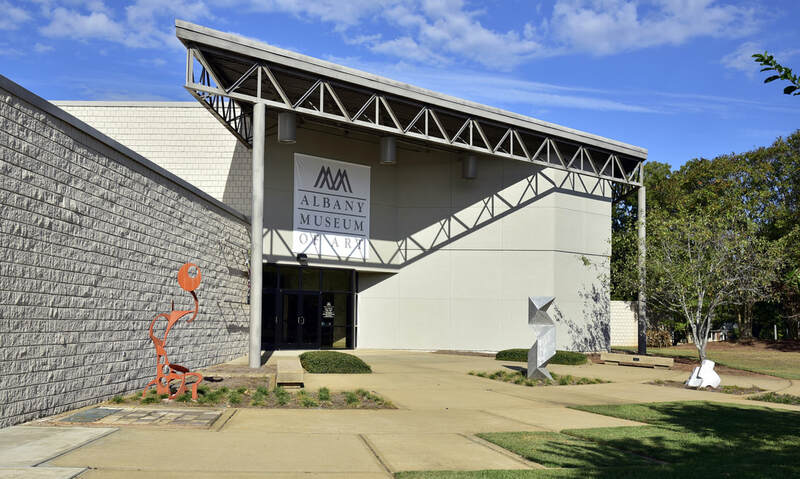 The first in a series of meetings on a proposed interdisciplinary museum studies minor at Albany State University is set for the Albany Museum of Art. The April 14 deadline is approaching for students who want to enter the Second Congressional District portion of the 37th annual Congressional Art Competition. A trendy new way of creating art -- acrylic pouring -- is the latest class for adults at the Albany Museum of Art. Glenn Dasher is set to return to the AMA for the opening of his exhibition, Glenn Dasher: In Retrospection; Monuments to Human Imperfection. Sculptor Glenn Dasher, former dean of the College of Liberal Arts at the University of Alabama in Huntsville, discusses his work while installing his AMA exhibition, Glenn Dasher: In Retrospection; Monuments to Human Imperfection. Chef Jared Hall, chef at One Flew South and featured chef in the Jet Setter dinner set in a private hangar at Southwest Georgia Regional Airport, talks about his cooking style and being a chef at the world's busiest airport. MUSEUMS ADVOCACY DAY 2018 AT WASHINGTON, D.C.
AMA Executive Director Paula Williams and AMA Board Chairman Ripley Bell promote museums on Capitol Hill on Museums Advocacy Day, organized by the American Alliance of Museums. See the Albany Museum of Art in the news somewhere we missed? Email a link to jim.hendricks@albanymuseum.com. Artists Masud Olufani, Mike Landers and Benjamin Britton will attend and talk with guests at the Albany Museum of Art's Winter Exhibitions Reception. The Albany Museum of Art joins with the Albany Civil Rights Institute, Albany Symphony Orchestra and Albany Area Arts Council to present the annual Black History Month concert on Feb 28, 2019. Exhibit of works by by sculptor and multimedia artist Masud Olufani explores language and history from the African diasporic experience. Mike Landers creates fine art with Lego blocks in Stack: lego Works, exhibiting in the AMA's East Gallery. Paula Williams to retire as executive director the AMA on June 30, 2019. Albany Chef Laura Piovesana is featured chef at Dec 29 supper, Felice Anno Nouvo. Updates on downtown relocation of Albany Museum of Art. Exhibition by artist Benjamin Britton shows in West Gallery. Second event of season is What the Funk. College and high school writing competition continues through Nov 25, 2018 with awards to be presented at the AMA in January 2019. Albany Museum of Art supper series announced. Albany Museum of Art one of the reasons Albany is a good place for retirees. The Albany Museum of Art brings professional chalk artists, craft beer, music and more to downtown Albany with a new signature fall festival on Sept 22, 2018. Sixty high school students from the Dougherty County School System and Deerfield-Windsor School discuss the difficult topics of race and racism at the Albany Museum of Art. A new season of Toddler Takesover starts Sept 4, 2018 at the AMA. The Georgia Artists Guild of Albany 25th annual juried exhibition opens Sept 2, 2018. Aug 24, 2018 marked the first anniversary of the reopening of the Albany Museum of Art after the devastation from the Jan 2, 2017 storm. The Albany Museum of Art and Dougherty County School System are partnering to ensure the system's second-graders get opportunities to view and learn about art. The Albany Museum of Art celebrates teachers with a special free event just before the new school year starts. The Albany Museum of Art and Flint RIver Habitat for Humanity each receives a $10,000 donation from the Artesian City Sertoma Club thanks to the Albany club's truck raffle fundraiser. Chloe Hinton, education and programming director for the Albany Museum of Art, has been named a finalist in the Albany Chamber of Commerce's Albany Under 40 awards. Neighborhood for Painters, an exhibition of works by Georgia artists Art Rosenbaum, Michelle Fontaine, Jennifer Hartley and Terry Rowlett, opens June 28 and continues through September 29, 2018. A visitor's look at Albany attractions, including the Albany Museum of Art. A retrospective on the work for the late Florence Samuels Prisant opens June 14 at the Albany Museum of Art. Coverage of the Albany Museum of Art's summer art camps for children and youth. A cinematic first that combines live acting with hand-painted film frames examines the life and mysterious death of Vincent Van Gogh at an outdoor showing of Loving Vincent Friday evening at the Albany Museum of Art. Admission is free. ​The Albany Museum of Art is inviting college faculty to participate in Educators as Artists: Juried College Faculty Exhibition, which will open August 2 and run through October 13, 2018 in the AMA’s East Gallery. The all-medium exhibition will be juried by artist and curator Didi Dunphy. Arta, founded in 2014, works with more than 350 specialized shippers around the globe who move fine art for galleries, private collectors and museums, including the Albany Museum of Art after the 2017 storm. Gerald Corker of Cairo will see his work displayed at the U.S. Capitol for a year after winning this year's Second District Art Contest. Families came out Saturday, April 21, for Spring Family Day, a joint event of the Albany Museum of Art and the Albany Recreation & Parks Department. Art museum brings out local families (WALB - April 21, 2018).